I am still wowed by this lovely weekend away in the Italian capital, the people and all the art and history. I am usually not the biggest fan of writing about places I discover newly. But I grew to learn, that you can explore places locally even if you just spend a short time there. 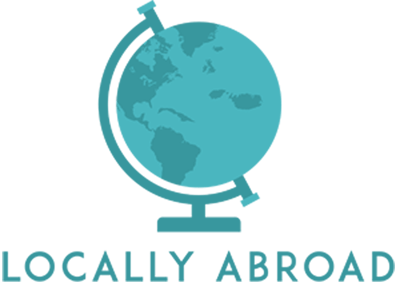 I am treating this weekend as a sneak peek at future adventures, and with this post, I am kicking off my new “Locally Abroad Weekends” category on the blog. 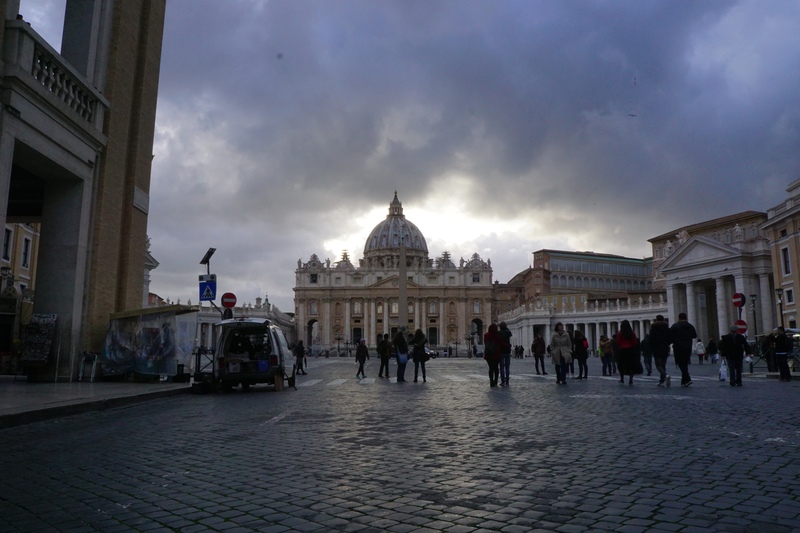 So let me take you to a Locally Abroad Weekend in Rome. It will be all about lovely weekend trips in Europe and how to make the best of them. I am not chasing after the significant landmarks and ticking them off my list, but I am after getting an idea of the place and the people. 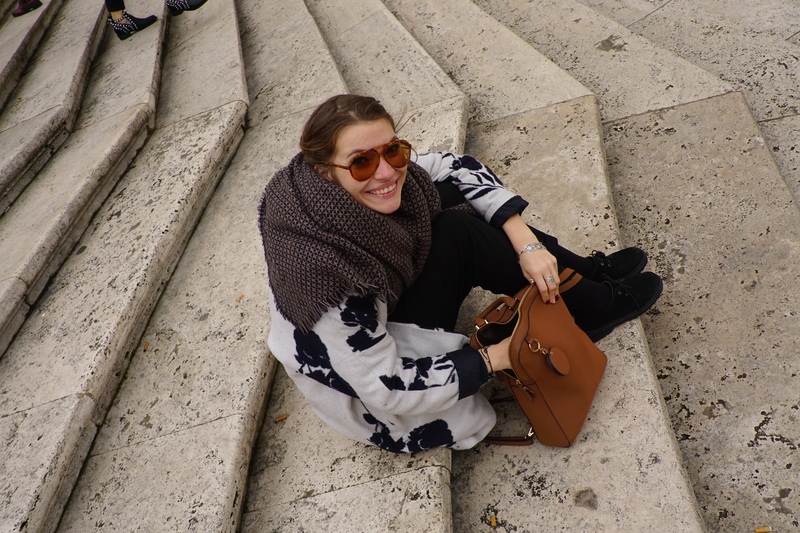 On this Weekend in Rome, I got a great idea of the city, and I know that I will be back soon. So without further to do, here are some tips for a weekend in the Eternal City. Rome has two airports that are connected to the center of the city by bus or train. The Rome Ciampino airport is almost exclusively reserved for private jets and Ryanair flights. There are flights to nearly all major and medium European cities, so it is very convenient to have a little city break in Rome. From Malta, for instance, there are flights with Ryanair and other airlines every day. Both airports Fiumicino and Ciampino are well connected to the city center. I recommend to take one of the shuttle buses for around 4-6€, that will take you directly to Termini Station. The train stationis located very conveniently and it is easy to get to any other part of the city from there, for just around 1.50 Euros with the public transport. Also, there is the option to get one of the official white taxis there, or directly at the airports. Where to stay during your weekend in Rome ? So speaking of areas in the city, that brings up the question where to stay and anything that is connected to it. First of all, I recommend to book in advance and be prepared to change last minute as it happened to us and the Airbnb we booked, also you should be aware of the Tourist Tax that is to be paid per person (3.50€ per person, per night). I recommend staying in the neighborhoods Monti or Trastevere for a more picturesque experience and close to the Termini station if you want it cheap and the transport to be quick. It is not the most beautiful area of Rome though and can be a bit loud and hectic. But you are just a few blocks away from the lively and beautiful Neighborhood Monti. There are many tourists in Rome, so if you go during the high season, make sure to have your place booked. I can highly recommend a spring weekend in Rome, before the peak season starts. What to do during your weekend in Rome? Well, there is a lot to do in Rome and uncountable monuments to visit. As we prefer slow travel, we chose to visit two main ones from the inside and take the rest to wander the streets and get a better picture of the city. 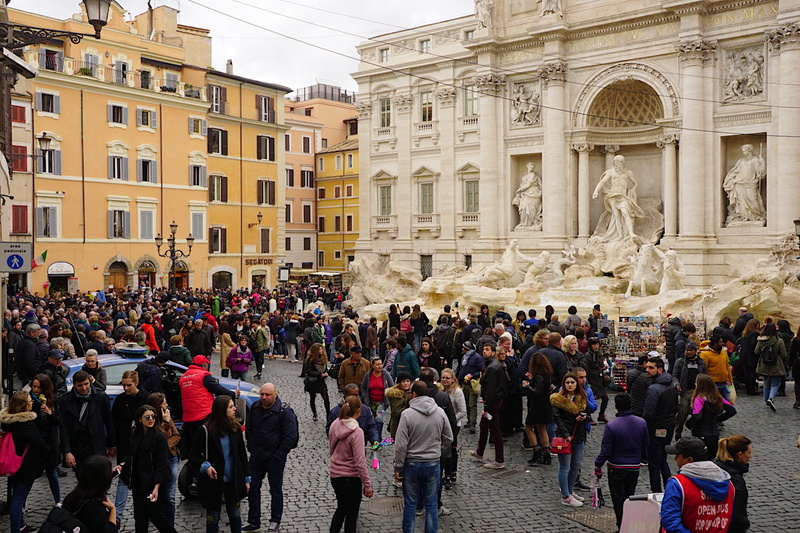 Since it was our first time in the Eternal City, we took a long walk passing famous places, like the Spanish Steps or the Trevi Fountain but also we made detours and backstreets away from the crowds and joined Romans on their weekend hangouts. We chose to visit the Colosseum and St. Peter’s Cathedral. Amazing and overwhelming enough for a weekend. I highly recommend to book your Colosseum Tickets online and skip the long line to save some time for more enjoyable moments. For St. Peter’s there is no entrance fee and it is one of the most impressive things I have seen. Mainly because it is human-made and not a natural wonder, it blew my mind. Even though I am not religious, you get the whole idea behind it and why people built this church to make it the Pope’s workplace. Take the chance to go in the late afternoon as it is less crowded and you will even get the chance to attend a mess if you are interested. We went around 5 pm and could pass the queue quickly. You can also leave your confession with designated priests, not really my thing but it is there for those who are interested. As for my favorite part: taking the streets. I love walking around cities, and Rome is just perfect for this. So I recommend to take long walks through the city and explore the small cafés and amazing shops. Take your time to walk through the hip neighborhood Monti and visit some of the vintage stores; they have some of the best I have seen so far, with well-preserved clothes and good prices. It also a great place to start of and end your day of discovering. Have breakfast in one of the small cafés and a glass of wine or beer at the fountain by night; there will always be a pleasant atmosphere. Keep reading for some of my food and drinks recommendations. While in the area make sure to visit the Mercato Monti, a modern arts and crafts market that features local artist, vintage clothing, jewelry and clothes, and other great artworks. The artists are super friendly, and up for a chat, also a hip and international crowd is hanging out here. It is even fun just to have a look. And if you want more local art visit some of the small galleries and design shops in the streets around the market. You will find yourself surrounded by the elevated Roman style. After having vibed with the Roman hipster folk, it is time to keep walking and discover less off the grid but not less beautiful parts. We kept our route through the Trevi Fountain, the Spanish Steps, the streets filled with high fashion shops around it, to the Column of Marc Aureil and the Galleria Alberto Sordi. The Galleria is a shopping center, that was merged smoothly into an old palace. It is one of the most appealing shopping malls I have ever seen. So even if you are not that much into shopping it is worth to pay a visit. The walk continues to the Piazza Venezia and the stunning national monument “Altare della Patria,” which is a massive monument to Italy and the Italian culture, It was built after Italy was united and features some well known Italian sculptors. From there it is just a short walk to the Piazza di Fiori, a charming square with a cute little market. And, you guessed it: excellent restaurants and cafés. I also recommend the area for a shopping Intermezzo, as there are many great clothing stores that offer unique items. Also, you will need some breaks from all the walking, so why not grab a nice cup of espresso something sweet, gain new forces and get some unique souvenirs to show off at home. Fiori is also a bit more laid back and perfect for a stroll around away from the tourist masses. It is a long but very rewarding walk through the city that helps you to get to see many different facets of Rome. That can be easily done in one day or split and combined with other sights and routes. It is just one idea you can follow or make your memorable walk through Rome. 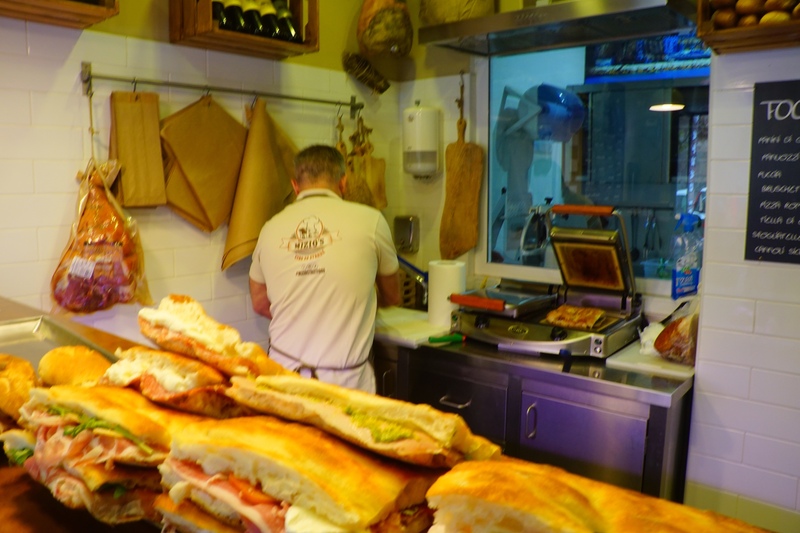 So I have mentioned the neighborhoods, which are great for food: Fiori, Monti, and Trastevere. 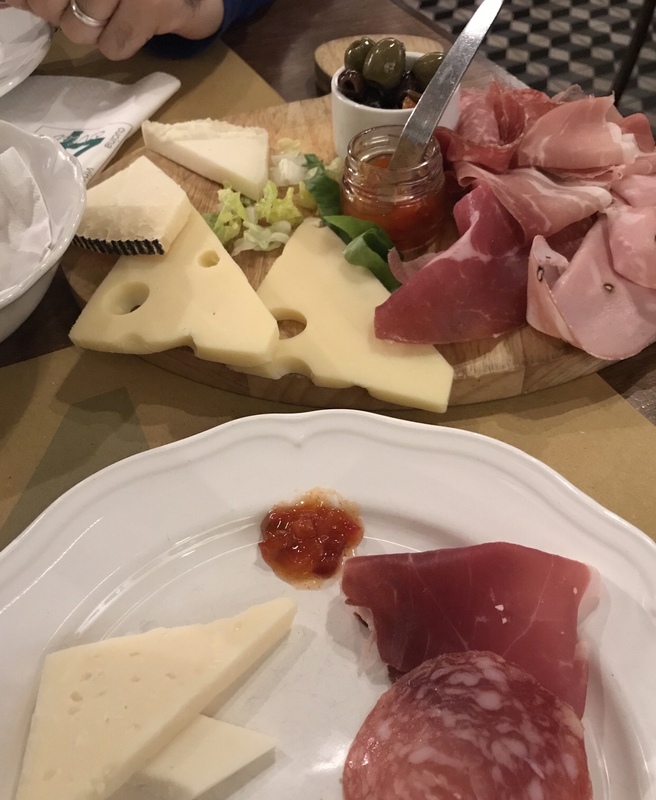 I am a huge fan of food and would love you to have a great meal on our weekend in Rome. And there is great Food in this city! Obviously, there is Pizza, Pasta, and Gelato, but there are also some Roman snacks, that you should not miss out on. So the Roman style Pizza, for instance, is more like a sandwich and the Rosetta is an actual sandwich. What I love is, that you can get everything in mini form as well so you can try a lot without getting super full. And of course, do not forget the delicious espresso after your meal! Here is a list of my top 5 restaurants and other foodie places that I can highly recommend, with my next stay I hope to add a lot more. This place is cozy and makes delicious pasta! 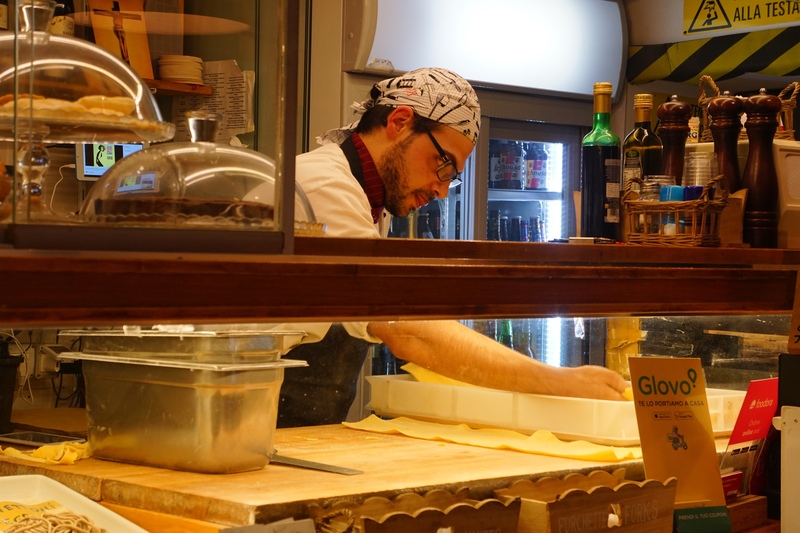 Handmade pasta, which is prepared just right in front of you meets friendly owners. This makes the place one of my highlights in Rome. The truffle pasta was just divine. There are many seasonal options to choose from. The restaurant is located in Trastevere (Vicolo del Cinque 40). Auntie Rosetta is the English translation of the bistro in Monti (Via Urbana 54) neighborhood. Enjoy the hip-hop tunes paired with their creative variations of the traditional Roman Rosetta. They also offer other treats, for brunch, lunch, and dinner. I can highly recommend the Chorus Rosetta, with Zucchini Flower, dried tomatoes, and Ricotta. It is a great way to start your exploring day. Fancy a drink just close to the fountain and the action in the Monti neighborhood. This bar is the Roman bistro, that you know from the movies. It has small bistro tables outside and the glass of wine just waiting for you. They also have great snacks and antipasti. Just right at the Piazza Madonna Dei Monti number 5. Great food, amazing wine, and a friendly chat. This restaurant is a popular hangout place for locals and was one of my favorites. 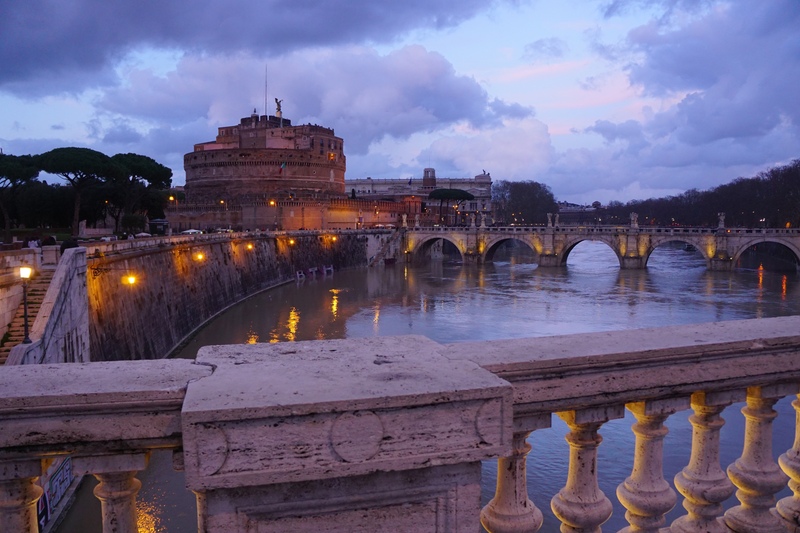 It is a fantastic spot to end the perfect day of your locally abroad weekend in Rome. It is just across the street from La Bottega del Caffe. Basically, any café in the areas Fiori and Trastevere is a great place to have an espresso shot and something sweet. Hope to be back soon to add more Weekend trips. Meanwhile, I am already dreaming about my next weekend in Rome.